The M3i.21xx series offers 4 different versions ranging from 250 MS/s up to 1 GS/s with one or two channels. The powerful analog section has been designed for highest bandwidth together with best signal quality and a versatile highly configurable amplifier section. 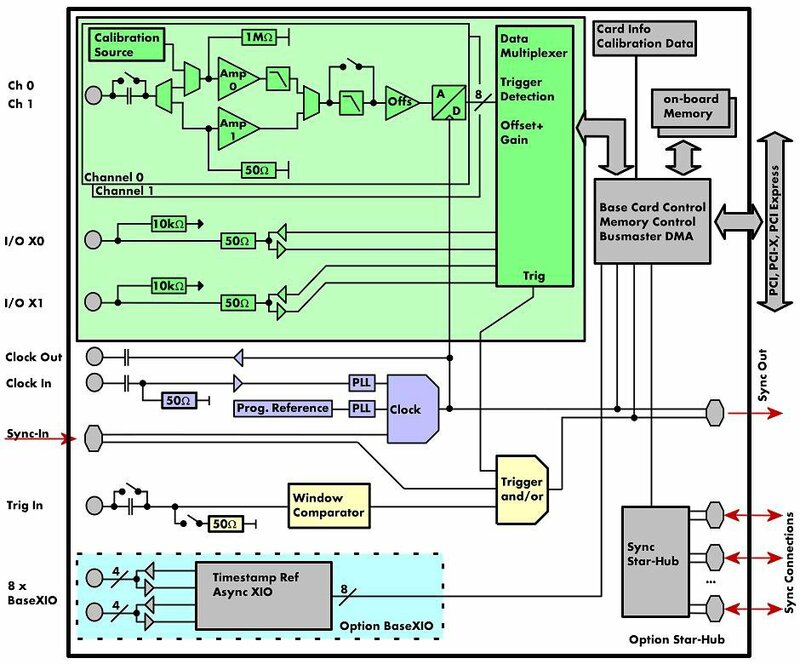 An extremely low dead time between segments in Multiple Recording mode specifies this card for fast repeating signals like LDA/PDA, RADAR or Ultrasound applications. The PCI bus in the form that is used today was first introduced in 1995. The last years it has been the most common platform for PC based instrumentation boards. Nowadays PCI based systems are more and more superseded by PCI Express based systems. Its world-wide range of installations, especially in the consumer market, still makes it a platform with good value. 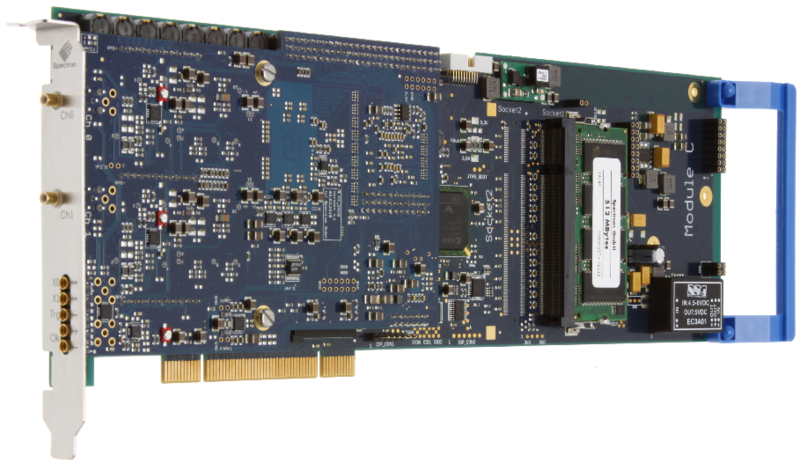 Based on the PCI bus the PCI-X bus was specified for applications needing a higher data throughput. On the PCI-X bus there are bus frequencies up to 133 MHz and data bus widths up to 64 bit available. The M2i and M3i cards use the PCI-X bus with 66 MHz to gain a high data throughput. All PCI and PCI-X cards from Spectrum are compatible to PCI as well as to PCI-X with 33 MHz up to 133 MHz bus frequency. The star-hub is an additional module allowing the phase stable synchronization of up to 8 boards in one system. Independent of the number of boards there is no phase delay between all channels. The star-hub distributes trigger and clock information between all boards. As a result all connected boards are running with the same clock and the same trigger. All trigger sources can be combined with OR allowing all channels of all cards to be trigger source at the same time. The star-hub is available as 4 card and 8 card version. The 4 card version doesn't need an extra slot. All boards can be triggered using a separate external trigger signal with a two level programmable window comparator. It's possible to use positive or negative edge. An internally recognized trigger event can - when activated by software - be routed to a multi purpose i/o connector to start external instruments. The card offers universal multi purpose I/O lines, which can be separately programmed as either input or output. These lines can be used as additional TTL trigger inputs for more complex trigger conditions. Most of the Spectrum A/D cards offer a user programmable signal offset opening the Spectrum boards to a wide variety of setups. The signal offset at least covers a range of +/-100 % of the currently selected input range making unipolar measurements with the card possible. Besides this the input range offset can be programmed individually allowing a perfect match of the A/D card section to the real world signal. All M3i cards offer two universal multi purpose I/O lines, which can be separately programmed as either input or output. When used as outputs, these lines can be used to output card status signals like trigger-armed or to output the trigger to synchronize external equipment. As an alternative to the standard SMB and MMCX connections the card can also be equipped with SMA connectors. The SMA connections are available for the analog input signals as well as for two of the additonal connections. These connections must be defined on the purchase order and can be a selection of: Trig-In, Trig-Out, Multi-Purpose X0, Clk-In, Clk-Out. The standard configuration of the card has two SMB connections for the analog inputs and five MMCX connections for auxiliary signals like clock, trigger or multi purpose lines. As an option these card can be equipped with SMA connectors or mixed SMA and MMCX connectors.